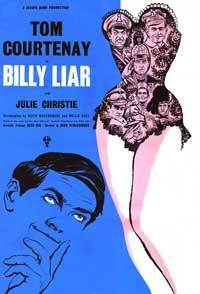 Billy Liar is a 1963 film based on the novel by Keith Waterhouse. It was directed by John Schlesinger and stars Tom Courtenay (who had understudied Albert Finney in the West End theatre adaptation of the novel) as Billy and Julie Christie as Liz, one of his three girlfriends. Mona Washbourne plays Mrs Fisher, and Wilfred Pickles played Mr Fisher. Rodney Bewes, Finlay Currie and Leonard Rossiter also feature. The Cinemascope photography is by Denys Coop, and Richard Rodney Bennett supplied the score.